(5) Read the DTCs following the prompts on the Techstream screen. Enter the following menus: Chassis / ABS/VSC/TRAC / Trouble Codes. (6) Check the details of the DTCs (See page ). (5) Operate the Techstream to clear the codes. Enter the following menus: Chassis / ABS/VSC/TRAC / Trouble Codes. (6) Clear the DTCs by following the prompts on the Techstream. Refer to the Techstream operator's manual for further details. 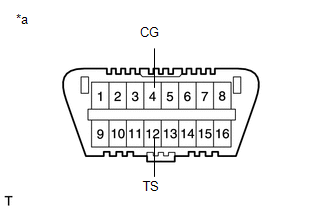 (1) Using SST, connect terminals 13 (TC) and 4 (CG) of the DLC3. (3) Observe the blinking pattern of the ABS warning and slip indicator lights in order to identify the DTC. If no code appears, inspect the TC and CG terminal circuit, and ABS warning and slip indicator lights circuits. (4) Count the number of blinks of the ABS warning and slip indicator lights. When the system is operating correctly, each light will blink continuously in a pattern of 0.25 seconds on, and then 0.25 seconds off. When one DTC is output, each light will output the same code at 4 second intervals (for example, code 21 would be output as 2 blinks, a 1.5 second pause, and then 1 blink). When 2 or more DTCs are output, each light will output a different code at 2.5 second intervals, and when all codes have been output, there will be a 4 second pause and the sequence will repeat. When multiple codes are stored, they are output in order starting with the lowest DTC number. (5) Check the details of the DTCs. (6) After completing the check, disconnect terminals TC and CG of the DLC3 to turn off the display. If 2 or more DTCs are detected at the same time, the DTCs will be displayed in ascending order. (3) Clear the DTCs stored in the ECU by depressing the brake pedal 8 times or more within 5 seconds. (4) Check that the warning light indicates a normal system code. (5) Remove SST from the terminals of the DLC3. The DTCs cannot be cleared by disconnecting the battery terminal or the ECU-IG NO. 3 fuse. (b) Check that the ABS warning and slip indicator lights go off within approximately 3 seconds after turning the ignition switch to ON.